Think back to 1994. Forrest Gump took the box office by storm. OJ Simpson led police on a low-speed chase in his white Bronco, and major league baseball players went on strike in August. Email was not commonplace, nor were websites, at least not as we know them today. There was a text-based thing called the Gopher, but Graphical User Interfaces had yet to enter the mainstream. 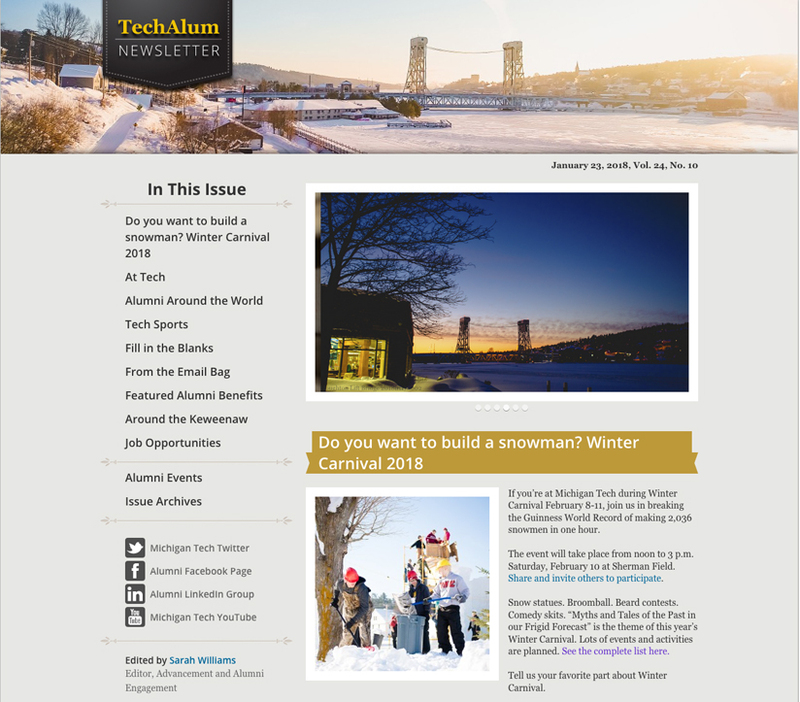 The TechAlum newsletter was born on May 9, 1994 – the first issue was sent to my entire contact list of email addresses – all 30 of them (my last issue on August 22, 2005 went to a list of 7,171). I used Elm and then Pine as my email client. There was no such thing as HTML email – only text and only in Courier. 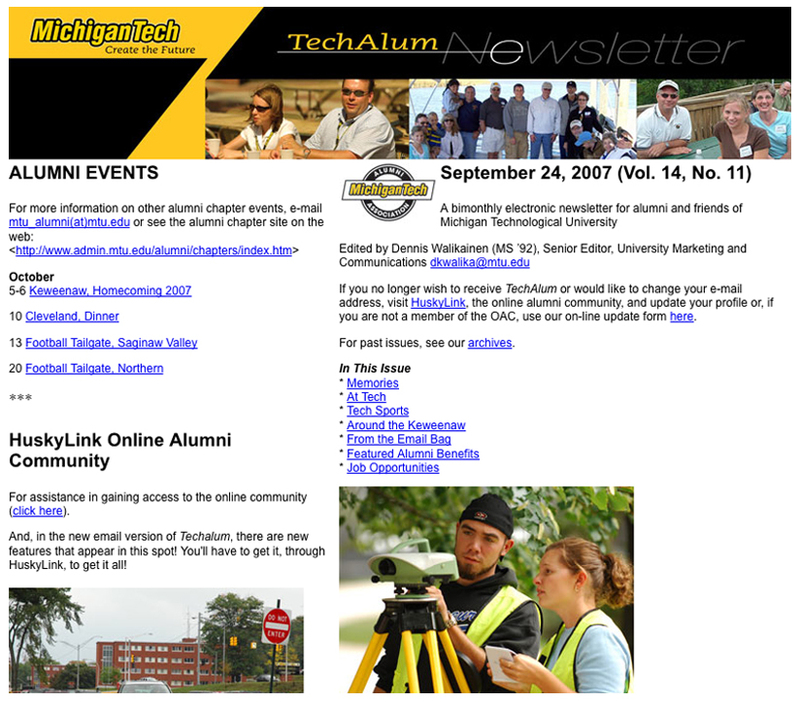 At the time, we established that TechAlum was the first electronic alumni newsletter in the country. I got the idea after reading about a professor in Texas who was using this new electronic mail system to keep in touch with some students. For 11 years (531 issues), I produced the TechAlum newsletter as a weekly email. 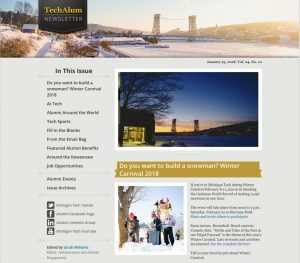 It included several standing sections, including a short column about life in the Keweenaw, news from Michigan Tech and local news, weekend sports scores, and the e-mailbag with letters from readers. 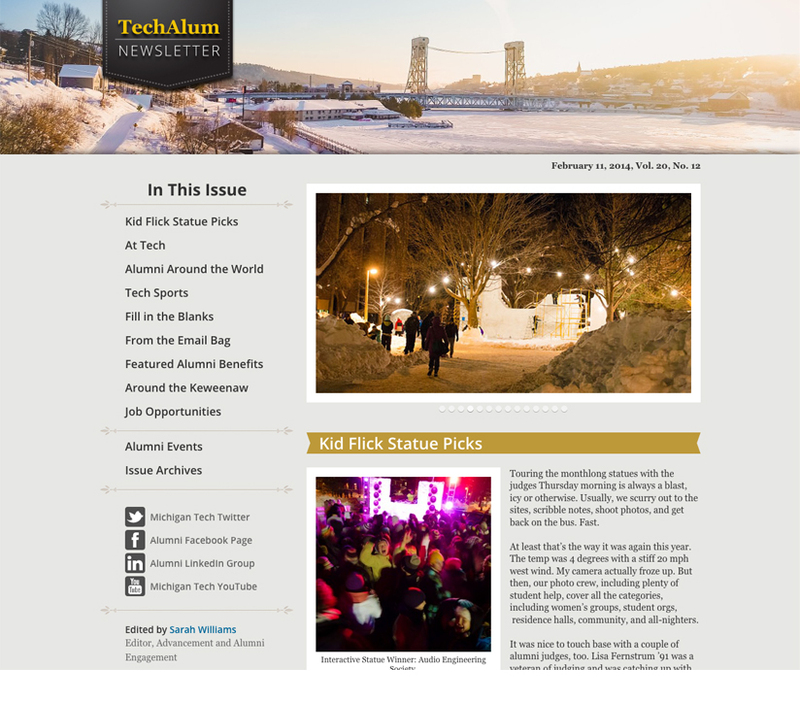 My great joy was sharing stories about life at Michigan Tech and in the Keweenaw. One story – about my inadvertently trashing my snowblower – led to the verbification of my name (that snowblower was “Woodbecked”). In return, readers would share their stories revealing the rich Michigan Tech heritage shared by alumni of all ages. 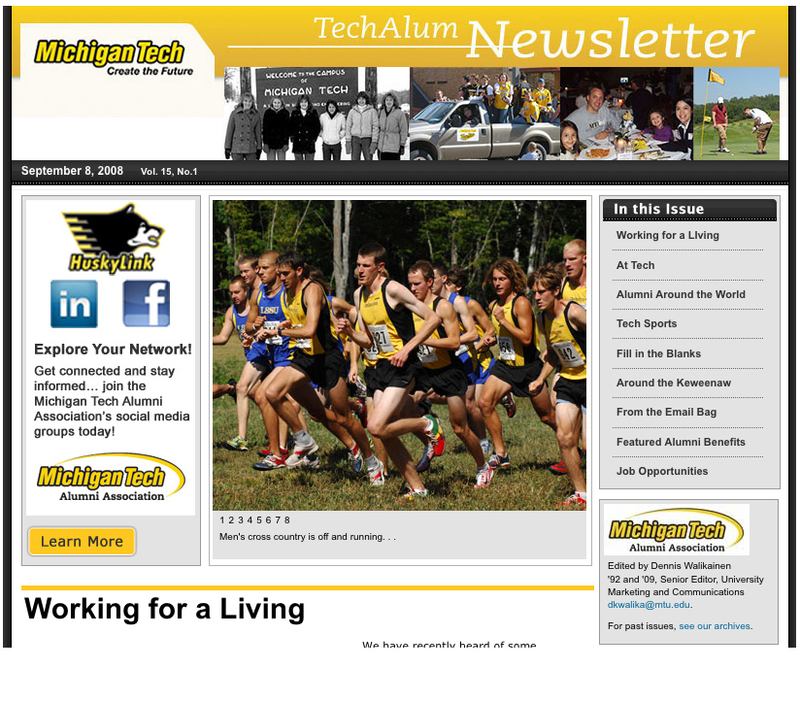 Moving TechAlum beyond a text-based email newsletter was first done to include photos. In the ten years I was involved, all the changes were done to make it more interesting, attractive, and interactive. Also, going to every other week was a great innovation, as I had more time to develop content. 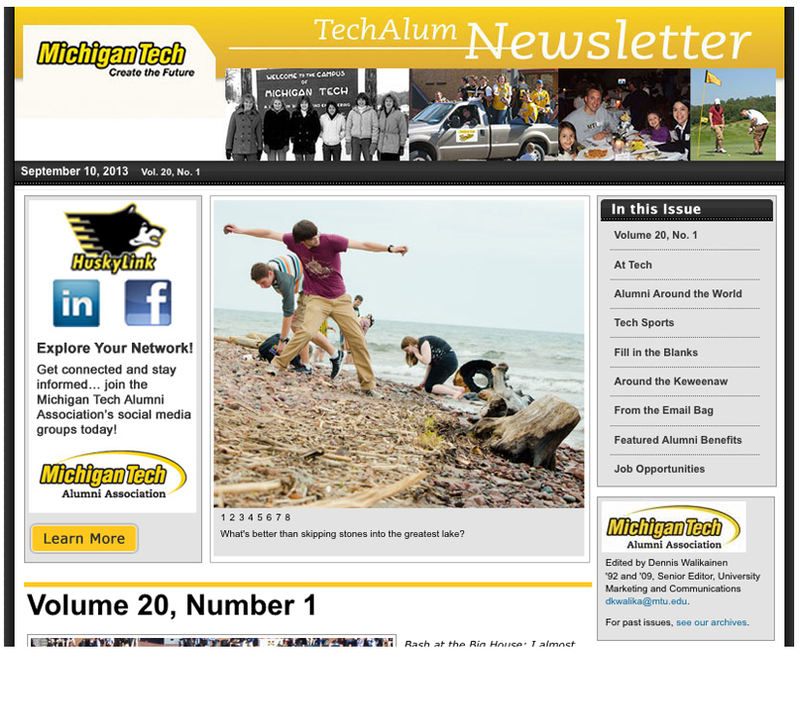 TechAlum is at its best when it is a conversation with alumni. After all, they have the best stories. TechAlum Through the Years: The design of TechAlum has changed over the years but the stories and memories have remained.